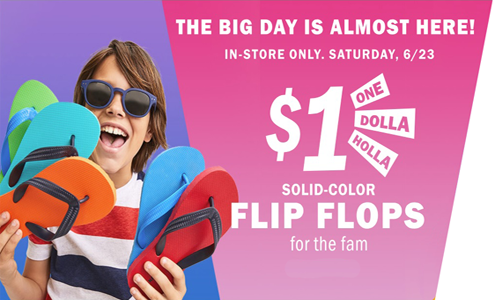 Old Navy is having their $1.00 Flip Flops Sale on June 23rd! In-Store Only! Select styles only; Solid colors only. Limit 10 per customer. While supplies last. Stores open Saturday at 7AM. 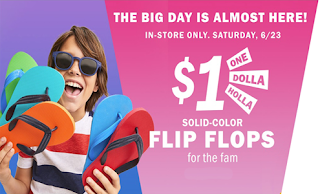 Offer valid on Old Navy merchandise only from 6/20/18 at 12:01 am ET through 6/20/18 at 11:59 pm ET in the US (including Puerto Rico) at Old Navy online at oldnavy.gap.com. Not valid at Old Navy stores. Offer not valid on Today Only Deal, 2 Days Only Deal, Hot Deal, Hi, I'm New, Best Seller, Licensed Product, Jewelry, and Beauty merchandise. Not valid on international purchases. Discount applies to merchandise only, not value of gift cards purchased, packaging, applicable taxes or shipping & handling charges. No adjustments on previous purchases. Not valid for cash or cash equivalent. Cannot be combined with other offers or discounts including Gap Inc. employee discount. Gap Inc. is not responsible for lost or stolen coupons.